Millions of people around the world strive to take care of their bodies each day. Some people might monitor what they eat throughout the day, whereas other people might make an effort to exercise more often. Many people will work to make changes in their environment that will benefit their bodies. For example, when the air is too dry, it can have harmful effects on your skin and sinuses. For this reason, many people choose to keep a humidifier inside their houses, often in the rooms that they are in the most. More often than not, people will keep humidifiers in the bedroom next to the bed. However, does keeping your humidifier too close to your bed have harmful effects on your body? Simply put, it is not a good idea to keep a humidifier close to your bed. Doing so can potentially result in serious harm. The best way to understand what type of danger a humidifier can pose is to understand what humidifiers do. As the name might suggest, humidifiers are designed to bring moisture to their air to remedy dry air in the house. This is designed to eliminate health problems, such as dry skin, bloody noses, dry sinuses, and aggravating respiratory issues. Different humidifiers will also work differently. For example, there are some humidifiers that are designed to produce cool mist, rather than warm mist. Other humidifiers use ultrasonic vibrations instead of fans to create even finer droplets of water in the air. The type of humidifier that you have will depend entirely on what type of moisture needs to be added to the living space. When the temperatures begins to fall during the winter, many people will decide to purchase a warm mist humidifier. These humidifiers not only combat the notoriously dry air that winter brings, but they help with the colder temperatures, as well. They work by boiling the water until it ends up vaporizing, eventually adding moisture to the air around you. On the contrary, cool mist humidifiers are designed to cool the vaporized air so that your room is not only cooler, but it is also moisturized. 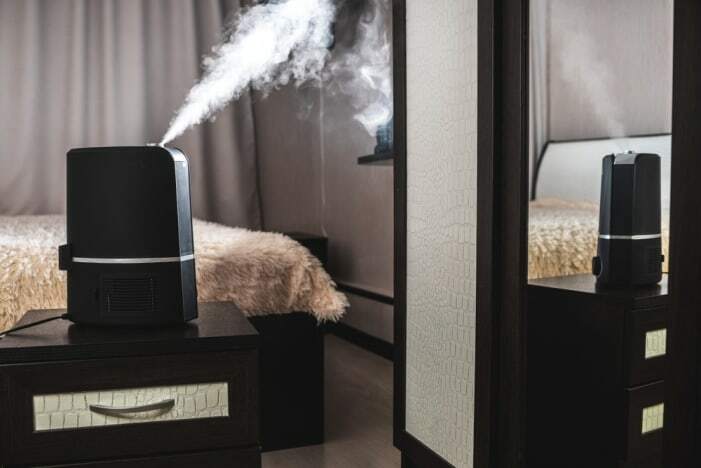 Out of these types of humidifiers, the warm mist humidifier is the most dangerous humidifier to have beside your bed for many different reasons. Of course, the danger that a humidifier presents to you will depend on the type of humidifier. If you have decided to place a warm mist humidifier beside your bed, you are in for some trouble. The warm mist humidifier works by boiling the water inside of the humidifier. This means that the contents of the humidifier are reaching boiling temperatures. As you might be able to imagine, having a device that can easily reach and exceed boiling temperatures beside your bed is asking for trouble. The humidifier could fall onto the ground or even onto you, causing burns. Nobody wants to be woken up in such a manner. Other humidifiers should be farther away from your bed because too much humidity can be a bad thing, as well. If you do not properly care for and clean your humidifier, you can end up spreading mold in the moisturized air. This can also bring about numerous health problems, especially in people who have weakened immune systems. Keeping your humidifier right next to your bed is simply asking for trouble. However, some people might want to keep their bedrooms comfortable. There are other ways that a humidifier can make your bedroom more suitable without risking your own health along the way. Where Can You Put a Humidifier? If you cannot place a humidifier right next to your bed, where else can you place the humidifier? Many people will choose to keep their humidifiers on a stable surface near one of the walls of the room. This eliminates the dangers of the humidifier directly falling on top of you or spreading mold to your body while you sleep. At the same time, the humidifier will still do its job. Whether you have the best ultrasonic humidifier or a warm mist humidifier, your room will remain as comfortable as it was before you moved your humidifier. With this in mind, if you seriously want to get a humidifier that provides you with the benefits of both cool and warm mist in one package, and yet it’s whisper quiet and germ free thus making it suitable for use in your bedroom, then the LEVOIT LV600HH Ultrasonic Hybrid Humidifier or the Pure Enrichment MistAire Ultrasonic cool mist humidifier are the ones we recommend you get. For some people, being able to sleep with a humidifier near the bed is important. After all, humidifiers have been shown to help with allergies and provide comfort while you sleep. This is particularly the case with warm mist humidifiers, as they can produce warm air. If you have no other choice but to keep your humidifier near your bed, then there are several precautions you should take to avoid the risks. The most important thing you will need to do is clean your humidifier thoroughly and on a regular basis. A humidifier is usually placed in the living room where all family members can enjoy and benefit from the warm or cool moisture coming out of the humidifier. It’s also a common practice for people to keep humidifiers in their bedroom so they can use it to moisturize the room overnight and wake up in the morning feeling fresh and relaxed. However, the best place to put a humidifier is where you feel you need it the most. So whether it’s in the living room or in the bedroom, ensure that’s the place where you’re going to get the most out of your humidifier. Humidifier on floor or nightstand? Should you also place the humidifier on the floor or on the nightstand? Well, in case of putting it on the floor, we wouldn’t recommend doing that because a kid or a pet or even an adult can accidentally bump on it while it’s dark at night and get burned if it’s a warm mist humidifier that produces steam. The humidifier can also get damaged from the impact it gets when someone bumps on it. Also remember that most of the dirt in the house usually settles on the floor. This means your humidifier will get dirty quicker than you expected and if you’re the type who doesn’t clean your appliance frequently, the humidifier will start producing moisture full of unhealthy germs and pathogens in your surrounding which can ultimately make you sick. Most manufacturers and experts also recommend placing a humidifier a few feet off the ground so as to prevent the area around it from becoming too moist. Now, if the floor is too moist and slippery, it can cause unexpected falls and also mold or mildew if a carpet is directly below the humidifier. Placing it on a nightstand is okay as long as the nightstand is not too close to your bed. If the nightstand is directly attached to your bed, then a better and safer option is to use a study table which is at a safe distance from your bed. Just ensure there aren’t any books or stationery on the table to prevent them from getting damp. We’ve clearly explained above why it’s not wise to put your humidifier next to your bed. You also need to read the warning and safety precautions laid out by the manufacturer. Most of the information about where to place or not to place a humidifier can be found in the instructions manual and it’s your duty to make sure you’ve read and understood the user manual to avoid any problems or issues when using the device. If you really want to enjoy the health and refreshing benefits of a humidifier, then sleeping with a humidifier every night is highly recommended. Some of the benefits include improved sleep especially for heavy snorers who often snore because of dry throats and sinuses, reduced risk of air borne infections, a softer and radiant skin since the moist air helps to combat skin issues such as flaking, cracking or dryness which are caused by cold, dry air in winter, fewer static shocks, comfortable sinuses, accelerated healing times especially if you have a cold or flu and of course, waking up in the morning without a growling voice. Those are just some of the benefits you’ll get from sleeping with a humidifier every night. Should Humidifier Run All Night? But are there also risks of leaving a humidifier running all night? Yes, there are a number of potential drawbacks to running a humidifier all night. First, you may suffer from allergy flare up if you’re using a filter-less humidifier that produces white dust. White dust is exacerbated by the use of tap water instead of using distilled water. To help alleviate this issue, it’s recommended to use a humidifier with a filter for trapping the minerals found in tap water. There’s also the potential risk of creating a conducive environment for mold, mildew and dust mites to breed in. Excess moisture comes with it’s own problems especially when you run a humidifier in an area where the percentage of moisture is higher than normal. Such a case will negate the benefits of running a humidifier all night. It’s therefore wise to measure the humidity in your room with a hygrometer before running a humidifier. If the humidity is higher than normal, then don’t run your humidifier because the excess moisture will condense on your bedding, furniture or floor and promote the growth of mold, mildew and dust mites. Why Should You Clean Your Humidifier? When you have no choice but to keep your humidifier next to your bed, the first thing you will need to do is ensure that the humidifier is on a stable surface. Nobody wants to risk having boiling water fall onto the bed while they sleep. Once the humidifier is on a stable surface, you should then look into ways that you can keep your humidifier clean and risk-free. Many people suggest using distilled water inside the water heater, as this will provide cleaner moisture in the air and reduce the risk of bacteria forming and molds growing. You will also need to clean your humidifier far more often than you would if you had it on the other side of the room. By doing these things, you can reduce the risk of unfortunate events happening with the water heater beside your bed, although it is still a bad idea. With that being said, it is not a good idea to place your humidifier right beside your bed. There are risks of costly medical bills and lasting damage to your health. Keeping your humidifier right beside your bed will also require more maintenance than it otherwise would to further prevent these risks. However, for some people, having the humidifier beside their bed is the only way they can be comfortable while they sleep. Whether or not you should keep your water heater beside your bed ultimately depends on how well you can take care of your heater on a regular basis and whether or not the risks of damaging your health outweigh the benefits of a comfortable night’s sleep.